He has now been dismissed after claiming Islamophobia was "a propaganda word" and "each Chinese person is a kind of replica of the next one". Downing Street said the comments were "deeply offensive". Sir Roger's appointment to head the new body was criticised at the time by Labour, who said his past comments on race and sexuality made him unsuitable to hold the post. The author has now left his position "with immediate effect" after an interview with the New Statesman in which he questioned the definition of Islamophobia and speculated on the influence of Jewish financier, philanthropist and liberal political activist George Soros in his native Hungary. He said he stood by comments he has made in the past that Islamophobia was a "propaganda word invented by the Muslim Brotherhood in order to stop discussion of a major issue". He said "anybody who doesn't think that there's a Soros empire in Hungary has not observed the facts" - a statement that critics have condemned as a conspiracy theory and an anti-Semitic trope. 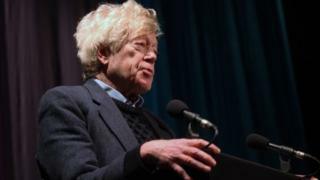 In a wide-ranging interview, he also said the Communist regime in China was "creating robots out of their own people" which he said was a "frightening thing". The Conservatives have been under pressure to deal with anti-Muslim prejudice in the party amid claims by a former chair Baroness Warsi that they have turned a blind eye to it. Communities Secretary James Brokenshire defended Sir Roger at the time of his appointment, saying his views had evolved and many of the attacks on him were "misinformed and ill-judged". It is understood Mr Brokenshire personally informed Sir Roger of his dismissal on Wednesday. No 10 said the comments were "deeply offensive, completely unacceptable and it's right that he's been dismissed". "He was appointed because of his expertise in a particular field but it's clear that his comments are distracting from that work," a spokesman said.